A while back, at the Geek-together for Wall*E this past summer, I met Elizabeth Caran. Through the miracle of the internet we have become fast friends in the months that followed. 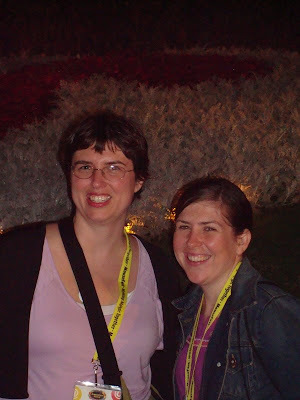 MouseFest offered a perfect opportunity to not only spend some time with Elizabeth, but also to serve as Geek Ambassador to several of her friends who had little or no experience with Walt Disney World. I believe the upbeat attitude towards Walt Disney World of my wife may have gone further than my “Did you know…” orations, but regardless it was fantastic to make some new friends and strengthen the bond that I had already begun to form with Elizabeth. Upon returning from MouseFest, Elizabeth asked if I would like for her to write an article for the Main Street Gazette. My response was a resounding, “YES!,” which brings us to today. As always, comments on Gazette articles are fantastic, but I would consider it a personal favor if you would leave a comment for Elizabeth so that she’ll come back a write for us again! As I was planning my trip to MouseFest, it occurred to me on more than one occasion that I was a poser to the highest degree. I only read a handful of blogs, and only two podcasts are on my list to listen to at all. I don't even always listen to every one of those. 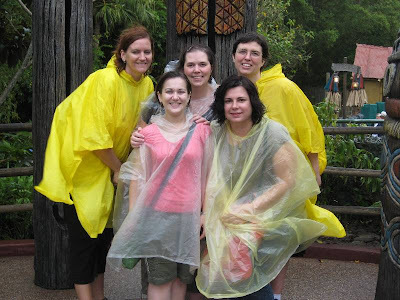 My love for Disney World is true… I am certainly addicted to all four parks as my six (seven with MouseFest) visits over the last 30 months can attest to. I'm also a fan of a few travel guides and books, being the good librarian I am. But I was really nervous about attending a fan convention with people who I knew were die-hard addicts--people who could tell you who exactly created which attraction and when they did so. Heck, I have a hard time remembering which attractions were built on which coast first. To make matters worse, I'm very shy in new situations. I get terribly nervous talking to new people and I am easily intimidated by large crowds. However, a friend of mine basically convinced me I HAD to go at all costs. To ease my nervousness, I decided to ask a few friends to come along, just in case I hated MouseFest. At least this way I knew I would have a good time no matter what. Four of my friends agreed to ditch their other responsibilities for the week and come along. I picked my events carefully, knowing I'd be hitting them all solo. First was Ryan Wilson and Greg Grimsley's Unofficial Rocking Chair meet on Thursday. This seemed to be low key and casual enough that I could face it without my knees knocking too badly. Plus, Ryan and I had met at a Wall-E screening this summer and had been Facebook buddies for several months, so at least he wasn't a total stranger. It was a fabulous way to ease into MouseFest, as the crowd was small, friendly, and casual. We rescued borrowed Ryan's wife and headed off to Artist's Pointe for drinks, dinner, and Christmas decoration viewings. On Friday, I attended the 500th Episode Party for WDWToday. Although there were close to 100 people there, it was also an intimate affair, with tables and enough seating for all. Plus, there was chocolate cake and free sodas. Really, how could that go badly? Again, this was an event where I knew someone already so I was a little more at ease than I would have been in a room of total strangers. By now, I was getting the hang of approaching total strangers, and I was already enjoying a new, strong friendship with Ryan and Aileen… two people who seemed completely in their element at a large event like this. They were also at the MouseFan Travel Illuminations Dessert Party and introduced me to even more new faces. By Saturday, I felt completely at home. I attended the Mega Mouse Meet with only a small bit of fear and found myself chatting with Lou Mongello and shaking hands with Jennifer and Dave Marx. Not to mention meeting Lee Cockerell, which may have actually been my favorite part of the whole event. Saturday night was simply a party. I sang and danced at Jellyrolls with about a hundred of my closest MouseFest buddies and it was, as Jellyrolls often is, a night to remember. Sunday, I had the pleasure of watching a boy beat all the men at Lou's Triviafest (I actually called him Mr. Mongello when I met him and he was most adamant about me never doing that again). By the time everything broke up on Monday, I knew that coming to MouseFest had been an excellent decision, and one I intend to repeat. So if you are like me… a fan… but not sure you're THAT big a fan… trust me. Make plans to go next year. It's totally and completely worth it. I'll be sure to say hello! Elizabeth has also written an article for the Main Street Gazette’s good friend, Imaginerding. Be sure to head over to Imaginerding and check out her reflection on the Disney Institute. Great writeup! I'm also hesitant to go to these types of events because I'm a little shy. But reading this makes me want to go next year. It sounds like tons of fun.